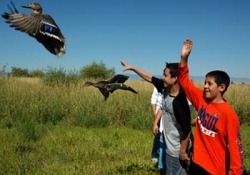 Yakima Basin Environmental Education Program (YBEEP) is an independent, regional 501(c)3 science enrichment nonprofit registered with the Washington State Charities Program (800-332-4483). Our mission is to provide environmental education for Central Washington K-12 public, private and home-school teachers, students, and the public; and to facilitate fish and wildlife habitat preservation and restoration. 2011 WSTA Special Award of Excellence to Bob & Lynn Tuck for Environmental Education given to Washington state teachers of science and their students. Type your question or request below and it will be forwarded to our email. We will reply as soon as possible.